Last week, an undersea expedition in the Gulf of Mexico came upon something rarely seen: asphalt volcanism, or eruptions of natural tar. But rather than an icky sticky mess, the thick petroleum "lava" had built elegant flower-like forms whose new name, "tar lilies," is this year's best entry in the long list of geological phenomena. Asphalt has been known since prehistoric times, and we in California should be intimately familiar with it. 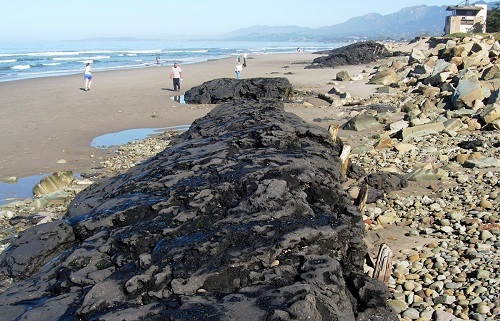 Natural deposits in the San Mateo Peninsula were mined to give San Francisco its first street pavements, asphalt seeps in the Central Valley were the start of a great oil-and-gas industry, and the tar pits of Rancho La Brea are a leading tourist attraction in Southern California. Nobody noticed asphalt on the deep seafloor, or at least no one published pictures, until 1978. But that was surely no surprise; it was merely a matter of time. We are very slow at exploring the ocean bottom in detail. It's like exploring the Mojave Desert by driving only off-road on moonless cloudy nights in a Humvee, limited to what the headlights can pick out. But that's what we're limited to, and the National Oceanic and Atmospheric Administration had put together the resources this year to send its ship Okeanos Explorer on a 59-day research cruise in the Gulf of Mexico that started in February and ends today. 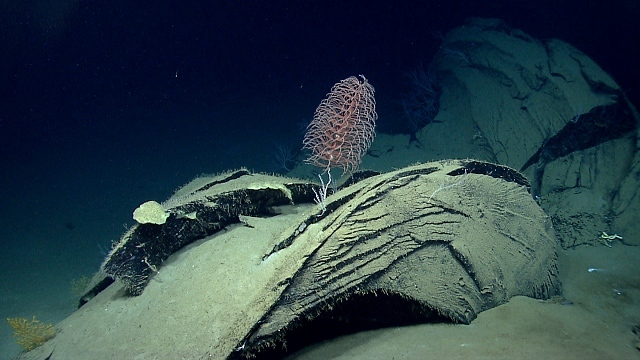 It's billed as "baseline characterization mapping" of areas new to science, the kind of public-interest work that many deep-sea interests benefit from but only government agencies like NOAA can do right. The ship has been mapping the seafloor with sonar and sending down its roving robot submarine Deep Discoverer and its trusty sidekick, the Seiros camera platform, to check out interesting things. Some of these are shipwrecks, but there are also natural features worth visiting: cold seeps, brine pools, mud volcanoes and other things arise from causes underneath the seafloor and provide clues to things that drillers as well as marine scientists might find interesting. The NOAA scientists didn't have "asphalt volcanoes" in their bucket list, but surely dive scientist Ian MacDonald, of Florida State University, knew they might be down there. Just ten years before, his research team had reported on a field of tar flows farther south in the Gulf in the pages of Science. He had even described the flows with the same terms used at the lava volcanoes at Hawaii—ropy pahoehoe and jagged aa. 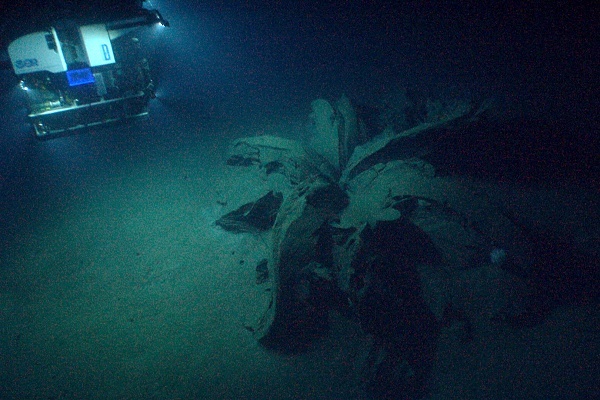 And sure enough, when the Deep Discoverer was sent to nose around an odd feature suspected to be a shipwreck, MacDonald knew right away what this beautiful object was: an asphalt flow that, while hardening in the freezing water, had split apart in a feature quickly dubbed a "tar lily." Approaching closer, the cameras showed that life had made a foothold on the asphalt. Deposits like these can support a host of microorganisms, along with higher organisms like tubeworms. A closeup of a tar-lily petal shows anemones and deep-sea corals on it, suggesting that it first "bloomed" several decades ago. MacDonald posted the expedition's entry for the day on the NOAA website. This discovery helps fill out our sparse picture of asphalt volcanoes. With three well-documented examples in the Gulf, plus others off Africa and California, we can now say that seafloor asphalt is a real niche in a seafloor habitat of ever-growing complexity and richness. It was there all along.